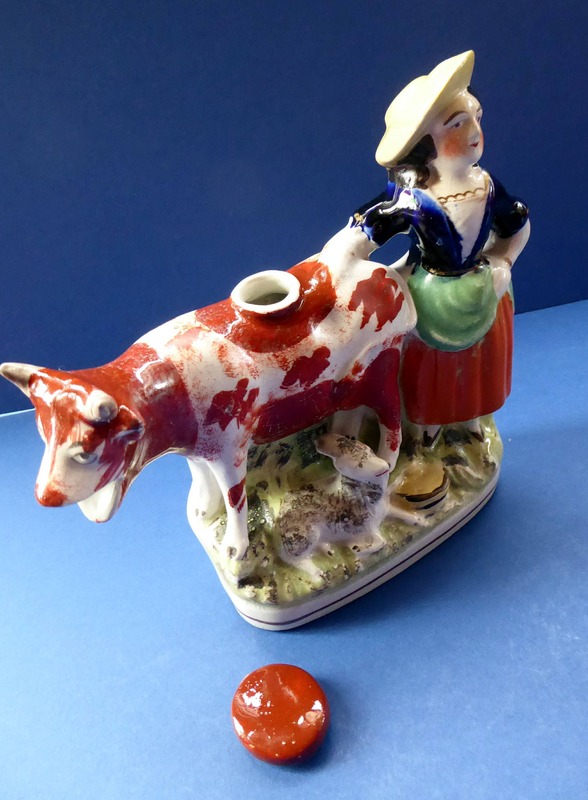 I always have a bit of a soft spot for old Staffordshire Figurines, and none more so than these pretty examples which are cow creamers and feature milkmaid's standing beside a cow. This one is utterly charming, and is one of a number of good quality flatback figurines in my Etsy store. 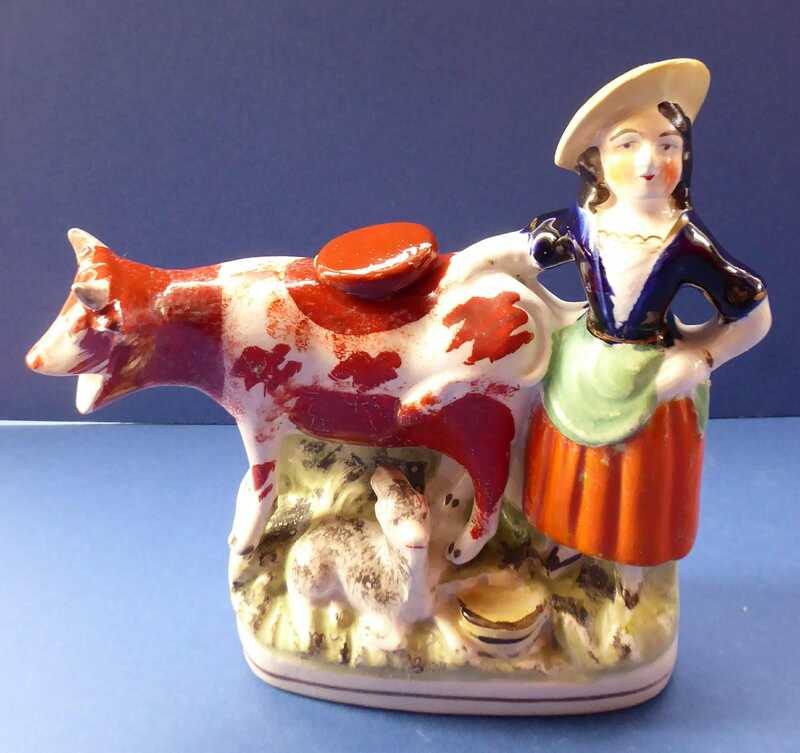 A pretty lady or milkmaid stands beside a white crummie who is decorated with handpainted rust coloured patches. The group stands on an oval base painted with green grass. The milkmaid has finished for the day - and she stops for a moment to rest her arm on the rump of the cow - and looks out at us as viewers. She wears a yellow broad brimmed hat. She wears a blue laced up jacket over her white bodice. She has an orange petticoat with a green over dress hitched up to keep clean. 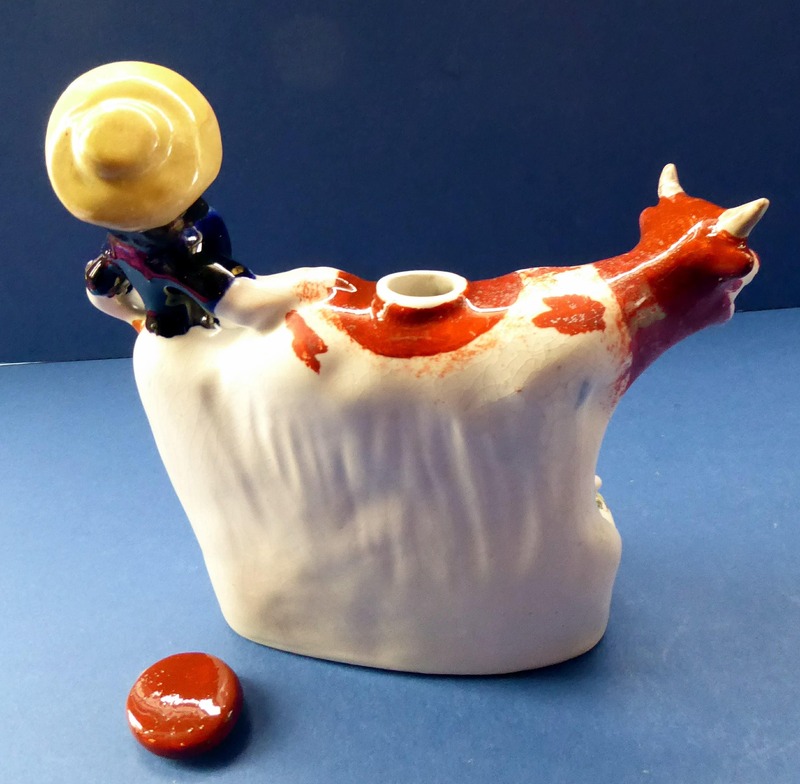 The cow has his mouth open and it acts as a pourer for the contents. 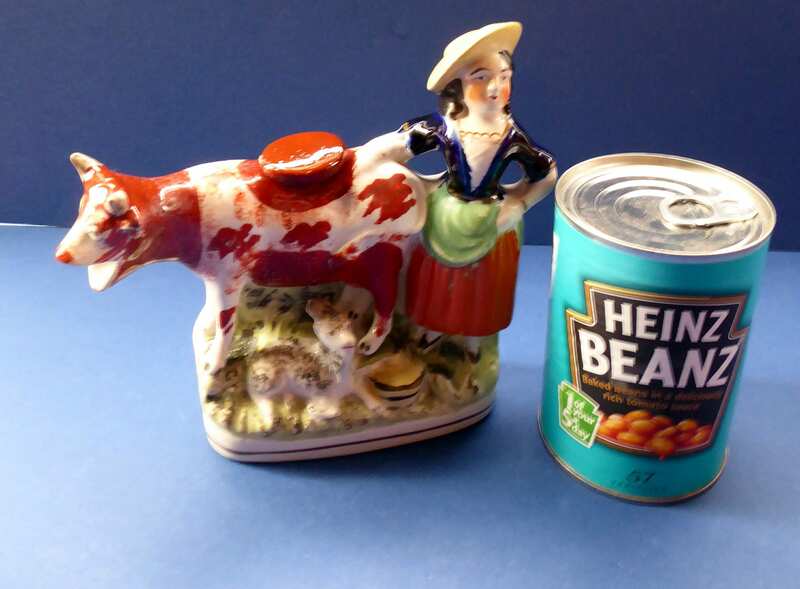 This one has a hole in the back of the cow for you to add your cream or milk into. It retains its original ceramic cover - which is often lost. This is certainly a most attractive and harder to find example and given its age (it dates to the late 19th century) it is in remarkable condition. There are no chips or damages. Dimensions: 7 inches wide and with a height of about 6 ½ inches. Very cottage chic - and would look fabulous on display in a country cottage or rustic bed and breakfast in the dining room. A fine example - have listed another couple from my collection. Fair price for such a fine undamaged example. Of course - being sold as a genuine antique 19th century example - and is certainly NOT a modern reproduction piece. In the UK, my creamer will be posted next day special delivery to make sure she is tracked and fully insured in transit.